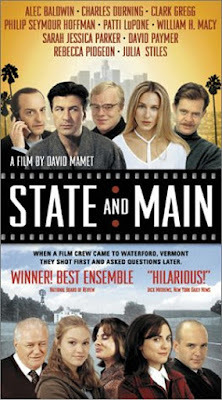 I don’t recall ever hearing about this movie when it came out back in 2000, but a friend recommended it recently on Facebook and it’s written and directed by David Mamet, and I generally enjoy Mamet’s work, so I figured we might as well go ahead and watch it. STATE AND MAIN is a movie about movies, the sort that Hollywood likes to make from time to time. A group of filmmakers descends on a small town in Vermont, and hijinks ensue. The locals are, for the most part, colorful and eccentric. The movie people are sleazy and self-centered. Alec Baldwin and Sarah Jessica Parker are the morally challenged stars, David Paymer the producer, William H. Macy the director, Philip Seymour Hoffman the scriptwriter. Among the locals, Charles Durning is the mayor, Ricky Jay owns the diner, Julia Stiles is his daughter, Rebecca Pidgeon runs a bookstore and the local little theater group. It’s a good cast. Macy is one of my favorite character actors, and he’s very good as the director who’s either a decent human being at heart or completely amoral, I never could decide which. The problem with STATE AND MAIN is that it ambles along, never develops much of a sense of urgency, and just is never as funny as I felt it ought to be. I kept thinking the basic plot would have worked great for a movie in the Forties directed by Preston Sturges or Frank Capra, with Barbara Stanwyck as the bookstore owner, Jean Arthur as the actress (or, let’s face it, the other way around would have worked just fine, too), Jimmy Stewart as the befuddled scriptwriter, and Cary Grant as the director. But that movie never got made, and STATE AND MAIN did, so I can give this one a mild recommendation. It’s never terrible, it’s amusing at times (the biggest laughs for us were in the closing credits, which tells you something), and I’m glad we watched it. And I stayed awake all the way through it, for whatever that’s worth. It's true. We enjoyed it but, it just never rose above that level. Your review pretty much sums up my experience, though I still smile whenever I think of Macy and Baldwin's performances. They really have a knack for playing jerks. Macy and Baldwin are both in a much better movie called THE COOLER that I need to watch again one of these days.